Clean Air, extreme efficiency and comfort at no additional cost. Air source heat pump, heat recovery unit, solar electric and solar thermal in an extremely efficient building make life comfortable and affordable. Clean washable air filters every couple of months and check ph of solar thermal fluid every five years. triple glazed windows, led lighting, high efficiency appliances,R-45 walls R-70 ceiling. White standing seam roof. No additional cost for new construction, lower ongoing maintenance costs, 90% lower utility costs than normal new construction. Look at each system as an organ of the body of the home. All the organs have to work together. Installers rarley see the whole picture. Working to make homes such as this the norm. 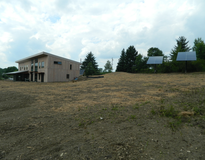 See 2 green homes with different approaches at one site. Park at 252 Mudget Hill Rd., Vassalboro, ME 04989. See both Near Zero Maine homes side by side. Call 207-266-4436 for more info and visit nearzeromaine.com.